Lora Barbour communicates with her daughter Genny, 16, who is autistic and suffers from epileptic seizures. Her family says her seizures are largely abated through the use of medical marijuana. A klaxon alarm sounds insistently in the Barbour household a little bit after 4 p.m. on a recent weekday. It signals a good thing: time to mix up another medical marijuana cocktail that has profoundly changed the lives of the Barbours – and likely paved the way for other families stuck between a legal system that has criminalized pot for decades and recent legislation meant to carve out compassionate care medical exceptions. 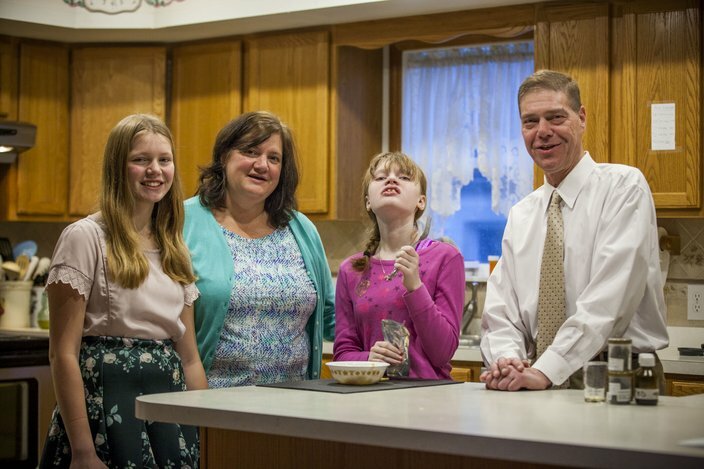 The Barbours' Maple Shade household revolves around Genny, a 16-year-old severely autistic girl with the mental capacity of a toddler, subject to severe epileptic seizures now largely abated by the marijuana. The drug is now allowing her to concentrate her limited cognition and, for the first time, form small sentences. When she recently spoke the words “I love mamma,” the family was brought to tears. There's also her 12-year-old sister, Marlee, bright, insightful and sometimes overlooked in all the hubbub of caring for her sister, with whom she interacts and communicates in a far deeper way now. Their mother, Lora, is a full-time mom and 24/7 caregiver since Genny’s birth. Their father, Roger, is a lawyer whose healthy income, in-house law office, legal skills and perseverance have made it possible for his daughter to finally get medical marijuana treatments while attending the school she goes to year-round. New Jersey Gov. Chris Christie, who has a track record of delay when it comes to moving ahead with medical marijuana regulations, recently signed legislation – that had sat on his desk for months – allowing for its limited medical use in schools with developmentally disabled and sick students. Days later, the Larc School in Bellmawr, New Jersey, where Genny is a student, installed guidelines allowing a designated caregiver – for now only her mother – to administer a drinkable marijuana oil concoction. Since the Larc school had initially refused to allow medical marijuana on school property, Genny attended half-days so she could be at home to receive her midday dose. But the Barbours sued to try and force the school to allow the medicine on site. Larc became the first school in the country to make provisions for proving the ingestible cannabis, though additional details are still to be worked out. For the Barbours, struggling for answers and the best possible care have been ongoing issues ever since Genny first showed an uncontrollable startle reflex – eyes darting, back jackknifed, arms spread – while an infant. Often the seizures lasted 20 minutes at a time. Their first physician was, in Roger’s word, “clueless,” though the doctor had the good sense to send the Barbours off for evaluations at the Children’s Hospital of Philadelphia. CHOP’s original diagnosis – infantile spasms or West Syndrome – sound relatively benign, though they are anything but. The epileptic episodes signaled Genny’s chaotic brainwaves and associated neurological impairments inhibiting her intellectual development. For Genny’s parents, Maple Shade High School sweethearts who dated for a decade before marrying, the learning curve was steep, expensive – and often mysterious. First there was an anti-spasmodic – from Canada – prescribed at a cost of $800 a month. It did nothing, her parents say. At the age of just two, there was an operation meant to unknot the twisted brain signals on the right side of Genny’s brain. Years later the Barbours were told the operation may have done more harm than good. A diet was prescribed that was meant to cause ketosis, the body essentially starving as it draws energy from far and muscle instead of through glucose in the blood supply. The diet was meant to lessen seizures; it didn’t, they said. Back to anti-epileptic pills. More than 20 pharmaceuticals in a variety of doses over the years, with limited results. “We just dealt,” said Roger, who tends to describe adversity with an accompanying laugh and joke. The decision to have another child took the couple time. “There was cajoling. And fear,” explained Roger, his wife nodding. The fear became visceral when a genetic test turned up an anomaly when Marlee was still just a speck in the womb. Having a medical intern – not a veteran doctor – break the news of the results helped to “scare the crap out of us,” said Roger. But further testing showed the same anomaly benignly present in Roger’s own DNA. Roger describes his younger daughter as an old soul who has mostly dealt quietly and patiently with the attention and time spent on caring for Genny – and also his absorption in the legal actions he’s undertaken on her behalf. But getting forgotten at school without a ride home and other short shrifts still happen now and then for Marlee, though less often these days with Genny more predictable stable and less disruptive. That’s helped Marlee sort out her own way. An athlete who had hung out with her pals from sports at the start of school, Marlee just moved to a lunch table filled with students she’s known for years, “old friends,” who provide more support and warmth than the cooler – but less accepting – clique she just moved on from. Her old friends were especially supportive when her family appeared on the ABC talk show, “The View,” in late September to lay out their ongoing efforts to have Genny treated with marijuana and still attend school. With Genny’s seizures reduced to about once every five days. rather than the daily occurrence they once were, her friends are more apt to come over and hang out, explains Marlee. “Seizures can be scary. And when she has a seizure now, they are less violent,” said Marlee of the changes in her sister’s behavior since the new therapy began. “We didn’t even have much of a relationship before. She used to sleep all the time. Now she hugs and kisses me,” said Marlee, as the Christmas tunes Genny plays 365 days a year – she finds them soothing – fill the air of the Barbour's home. Five years after passage, there are still just five dispensaries in New Jersey, serving just over 1,500 patients. The Barbours travel monthly to Woodbridge, but are hoping to switch to a newly approved location in Bellmawr. The cost is $12,000 a year – all out of pocket. For legal reasons, they must formulate their own cannabis blends, largely based on a swap of information between “marijuana moms” who suggests tweaks for each child's best results. They currently use several different strains, but one of them won’t be available when they start buying at the Bellmawr location, so they will need to tinker all over again. “I’m like a good Breaking Bad,” said Lora of her kitchen experiments that result from breaking down the buds in a slow-cooker to create an oil that Genny can drink in a small splash of soda. And while the recent action by Christie and Larc means Lora can now bring and dispense a dose of ingestible medical marijuana by personally visiting the school every day, the Barbours are still looking for simpler alternatives. Alternatives such as allowing the school’s nurse dose Genny – not possible, according to the school, due to current restrictions – or designating an additional caregiver, or enactment of legislative or legal alternatives that make the process less onerous. The most stressful days in their 25 years of marriage, according to Lora, came just before the marijuana treatments began and Genny’s life – and hers – changed for the better. A Catholic who can now finally manage a few hours a week away from home to teach religion classes, Lora has faith that an acceptance of the therapy will take hold and become more accepted. “It would change the world for kids,” she said. PhillyVoice Executive Director Lexie Norcross sits on the Board of Directors at the Larc School.